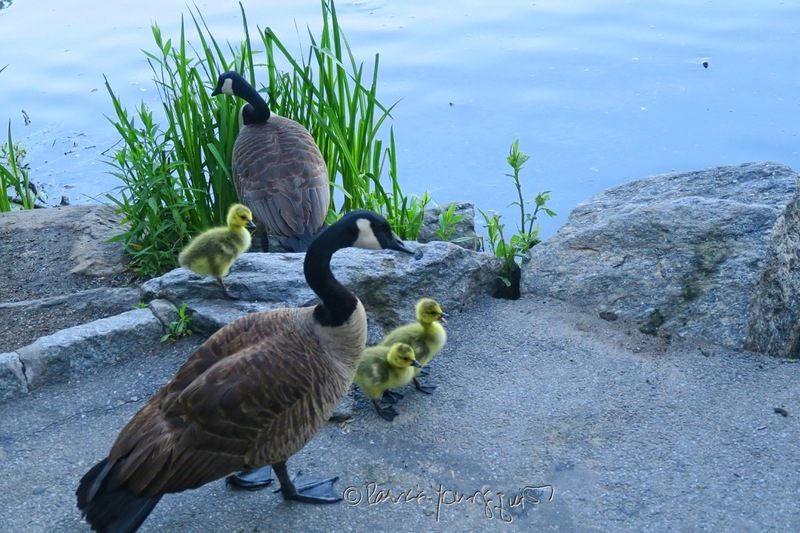 "Another day in the park... 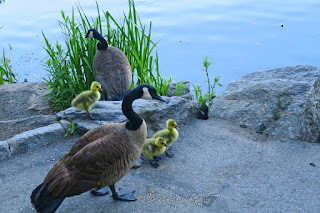 Everyday is the Fourth of July," are lyric lines from the song "Saturday in the Park," by the rock band, Chicago. I have quoted the song in prior posts here on Blogger when I've published an entry re my spending a Saturday in the Park, which is something I did yesterday. 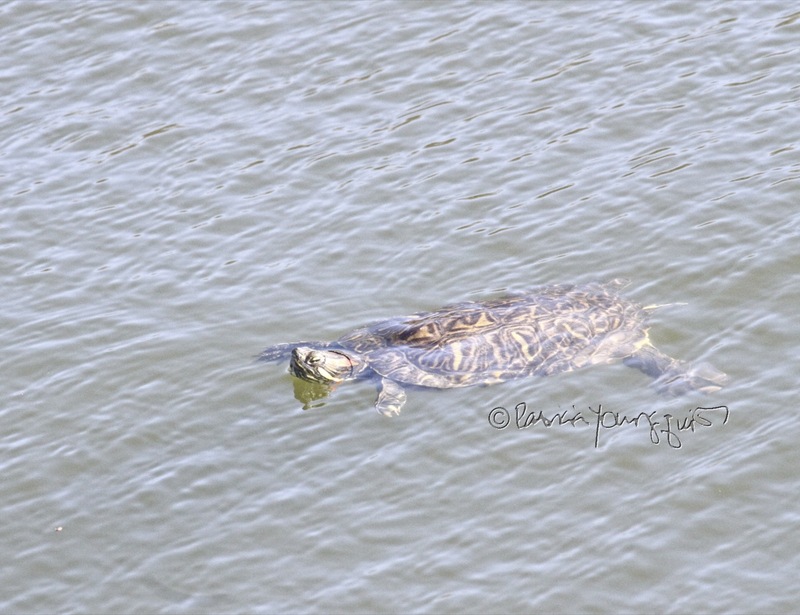 I went to Central Park to see if turtles were coming out of hibernation on the third day after the official onset of spring in our hemisphere. 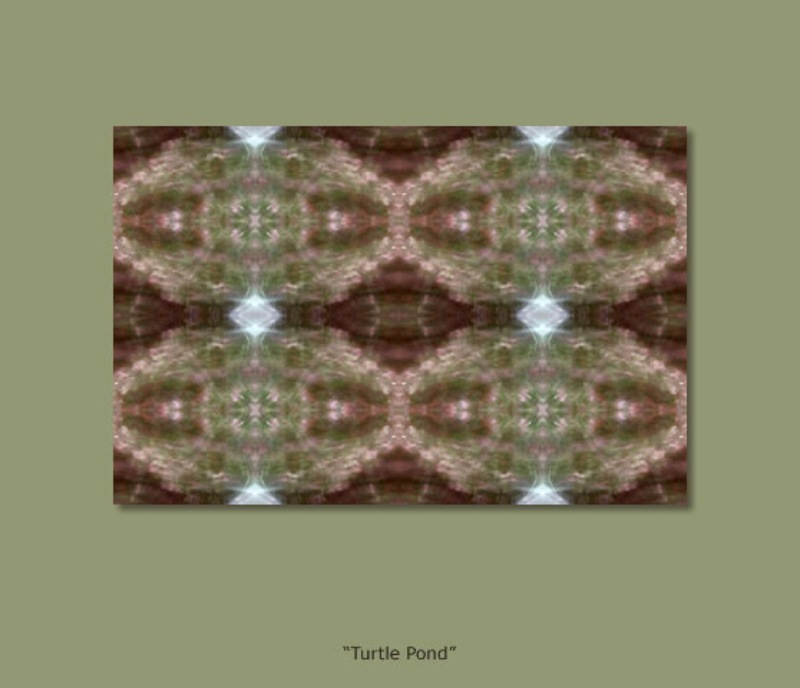 There were only a couple of turtles swimming (such as the one seen in the image posted above) in Turtle Pond, which means many of them are still hibernating under the water; for usually that pond is oversubscribed with this type of creature. 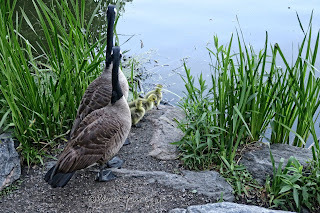 Only a small amount of people were gathered on the small wooden "pier" to the direct north-end of The Delacorte Theatre, in hopes of seeing turtles who had come out from their winter's nap. 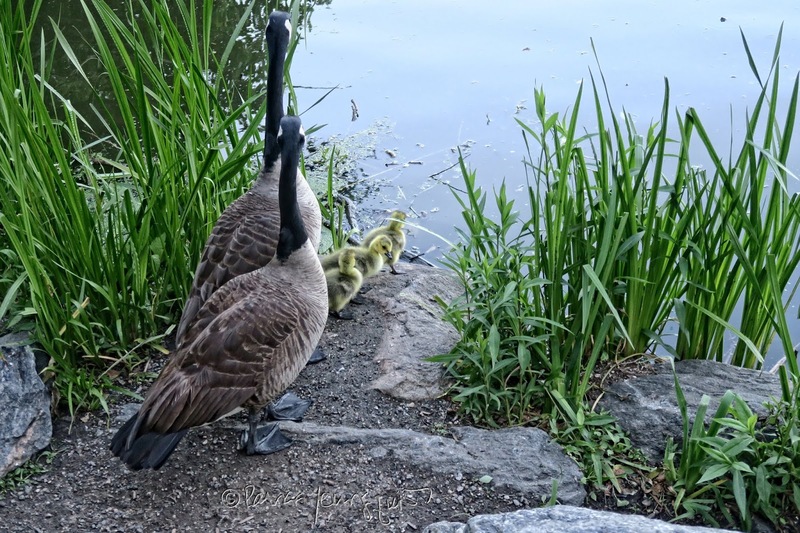 In addition to a view of these creatures as well as water fowl swimming in the pond, the pier provides a direct view of a grassy area which is along side the pond. 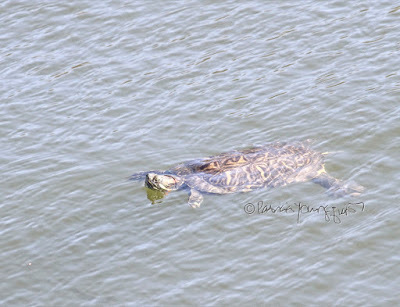 During the summer time many people can be seen sun bathing or picnicking there; but temperatures are still a bit chilly so the area has not been open to the public for the spring/summer season as of now. 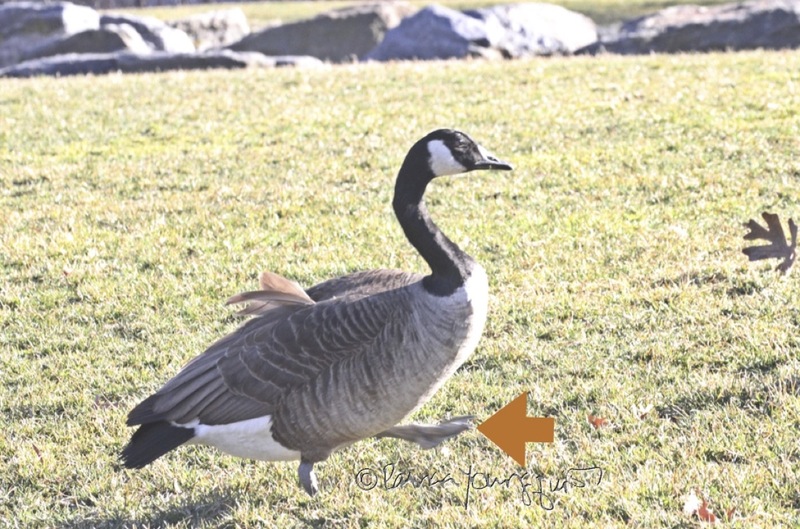 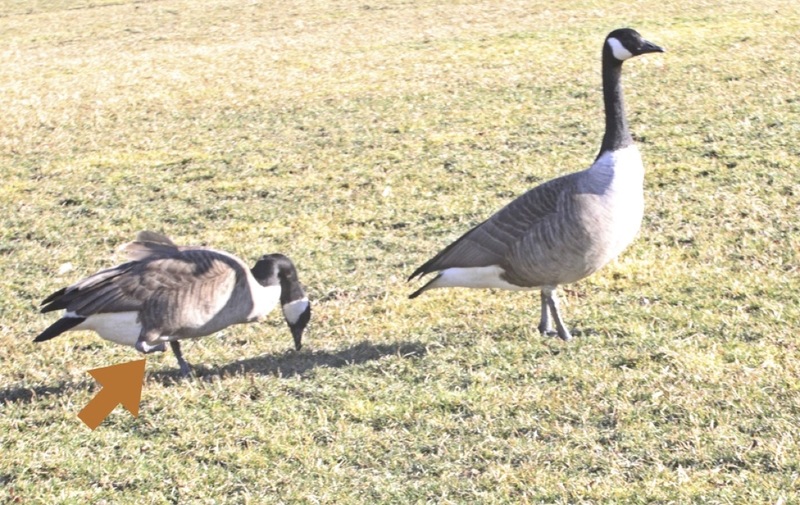 However, there were a number of Canadian geese "grazing" in the grass and a married couple took notice of the fact of a certain goose and explained to me that her name is Kaitlin. 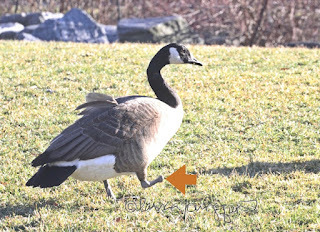 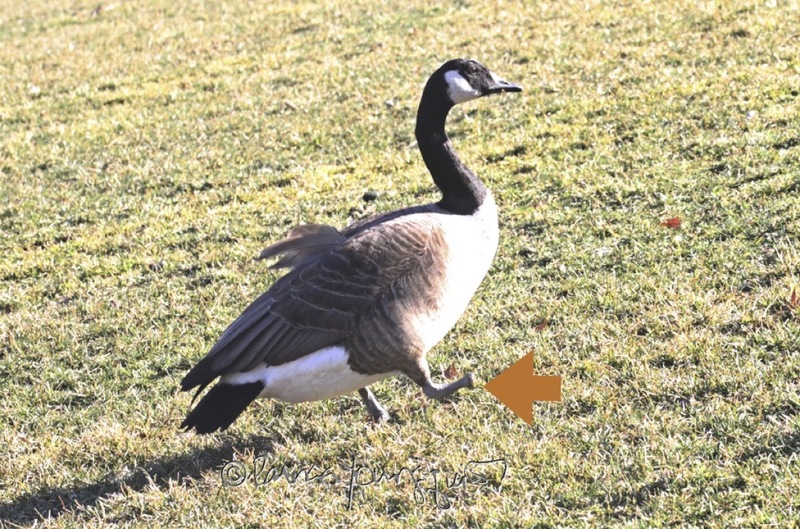 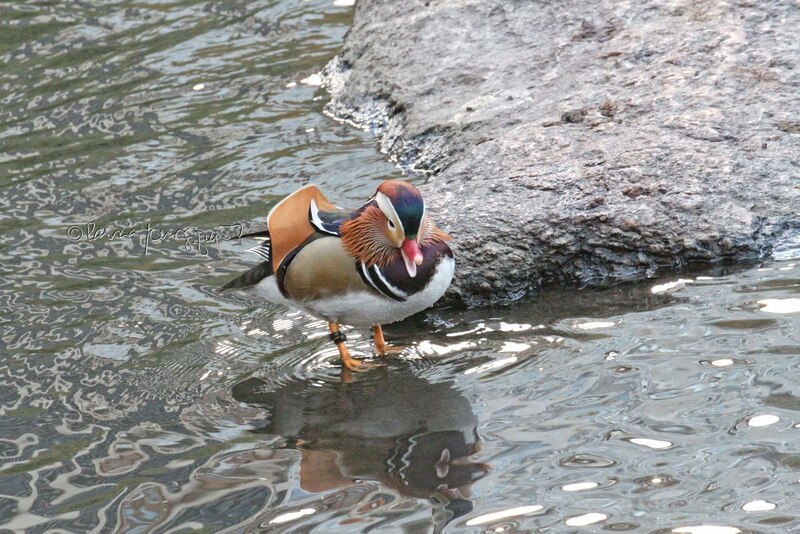 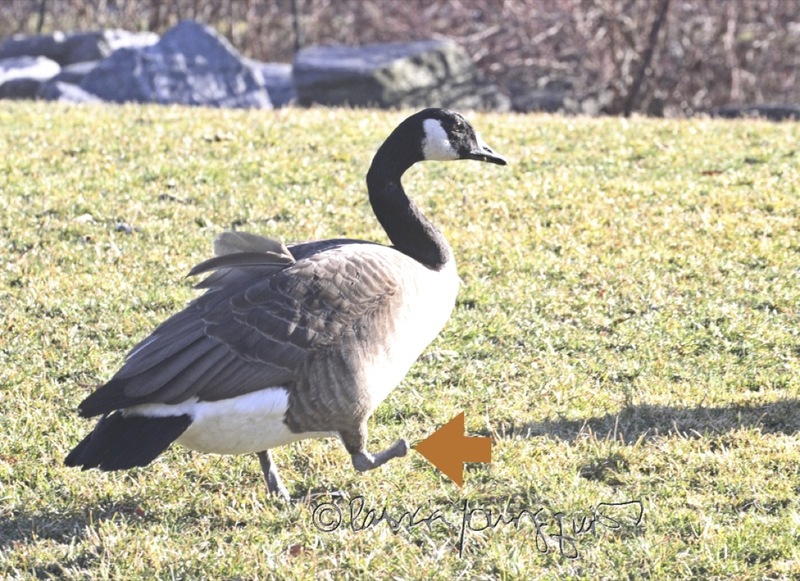 Evidently she is a goose who lost most of her right leg to fishing line while swimming in Central Park's Boat Lake. 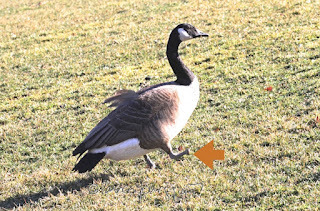 ....where I have indicated her missing appendage (by affixing an arrow). The following photos illustrate the goose's permanent injury. On lookers, familiar with the one-limbed goose and her faithful mate were impressed with his loyalty and compassion, which is characteristic of how ganders treat their partners. 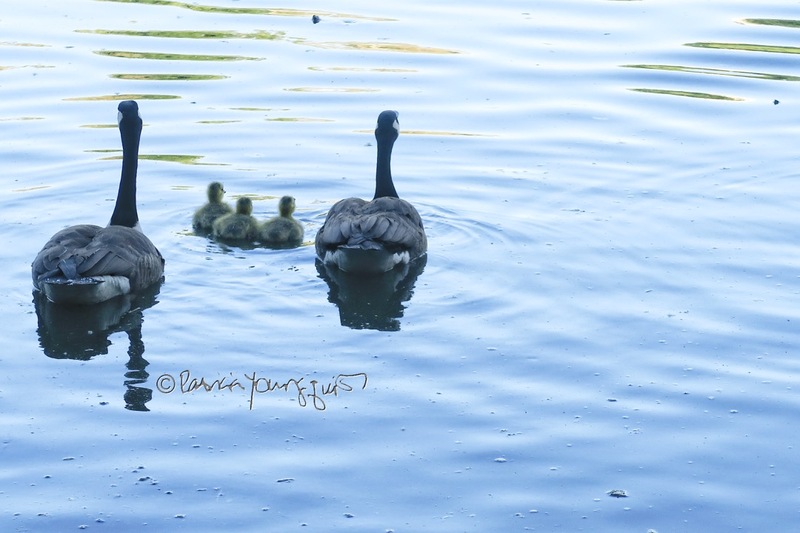 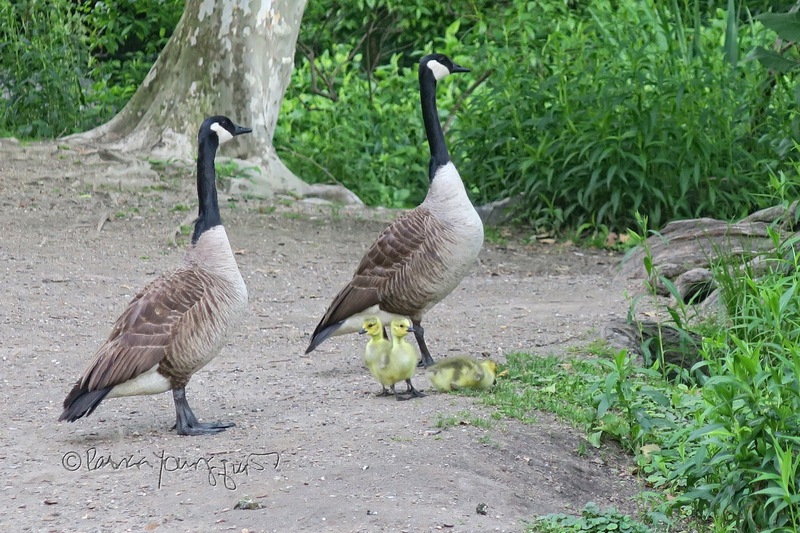 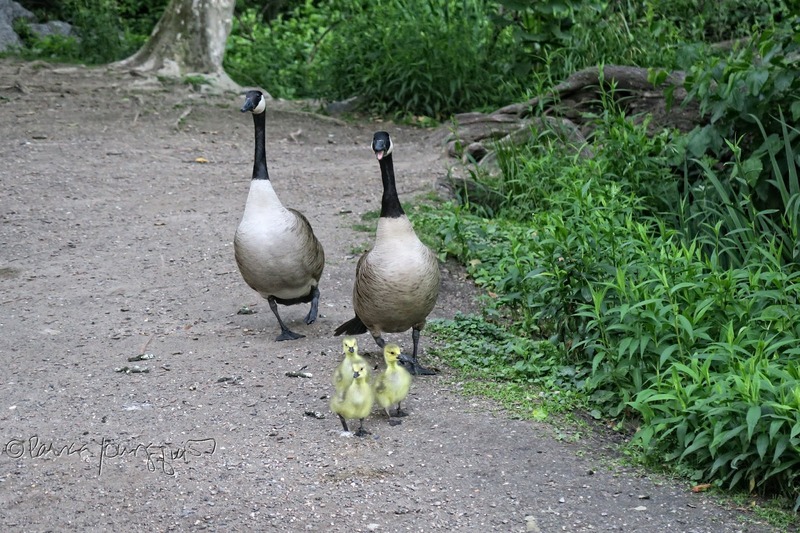 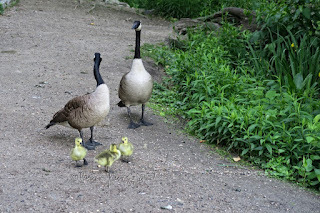 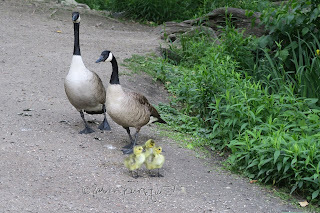 They also make excellent fathers, as you might surmise from seeing the next set of pictures featuring a family of geese enjoying an outing in Central Park. 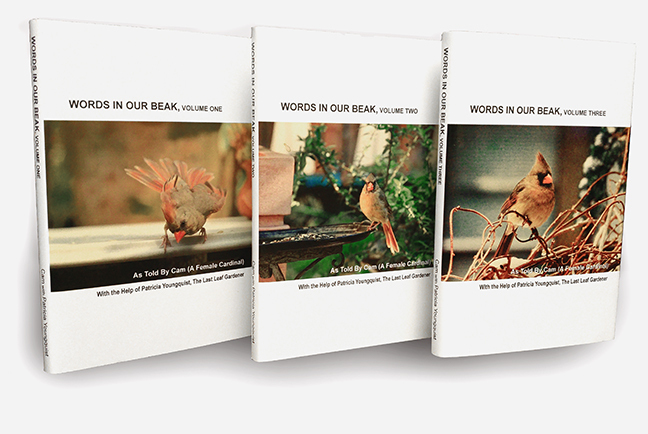 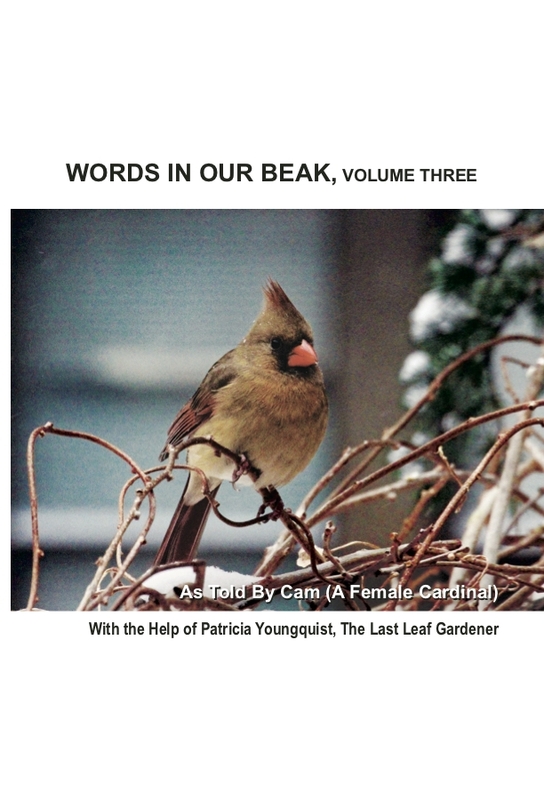 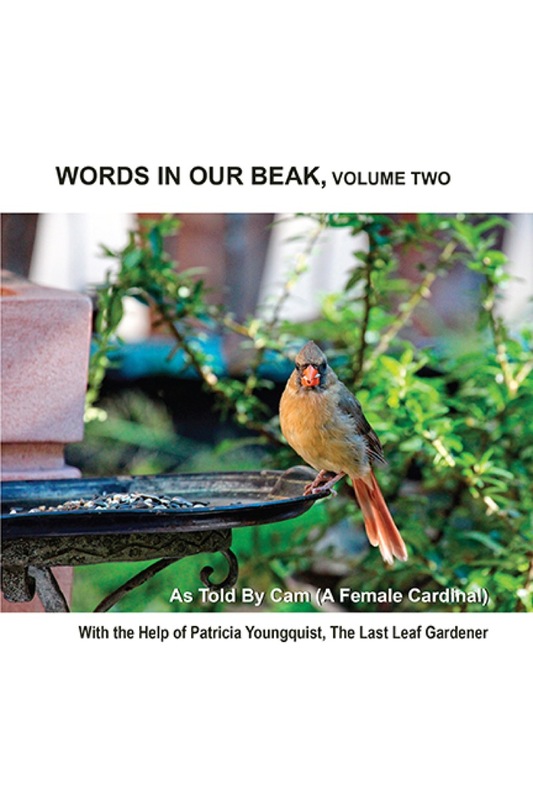 These pictures may look familiar to you, dear reader, for I've featured them in prior entries here on Blogger and a few of them are included in volume two of my book series, Words In Our Beak. 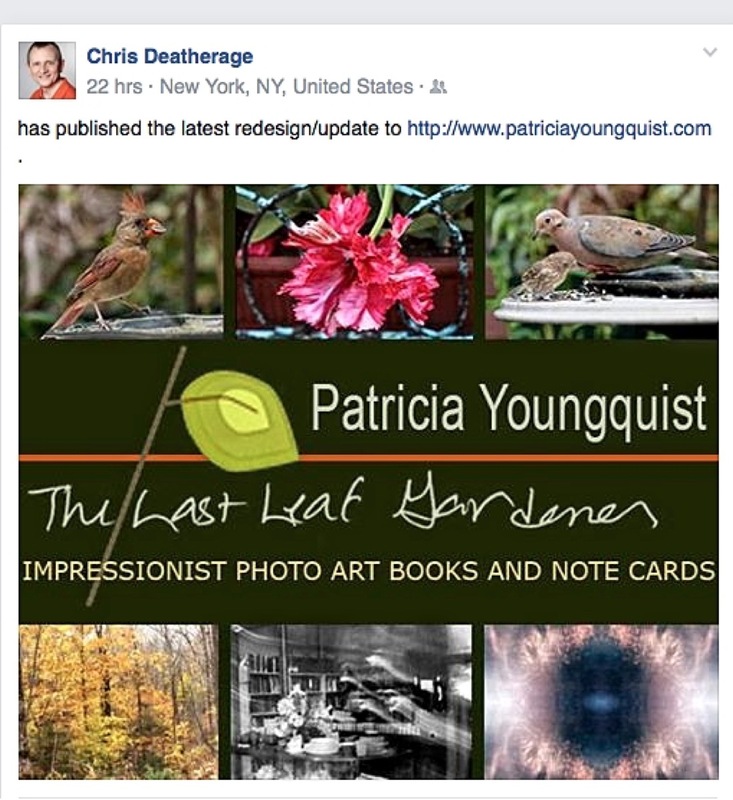 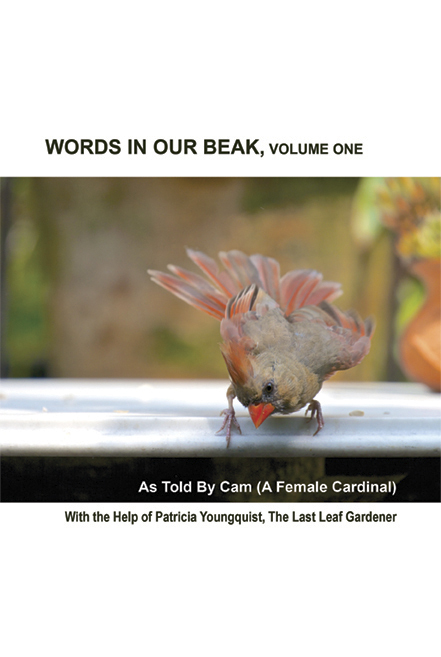 ... in bygone years which are included in a gallery that's on my website; is designed by Chris Deatherage, who also edited and formatted my Words In Our Beak book series. 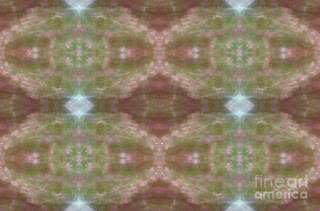 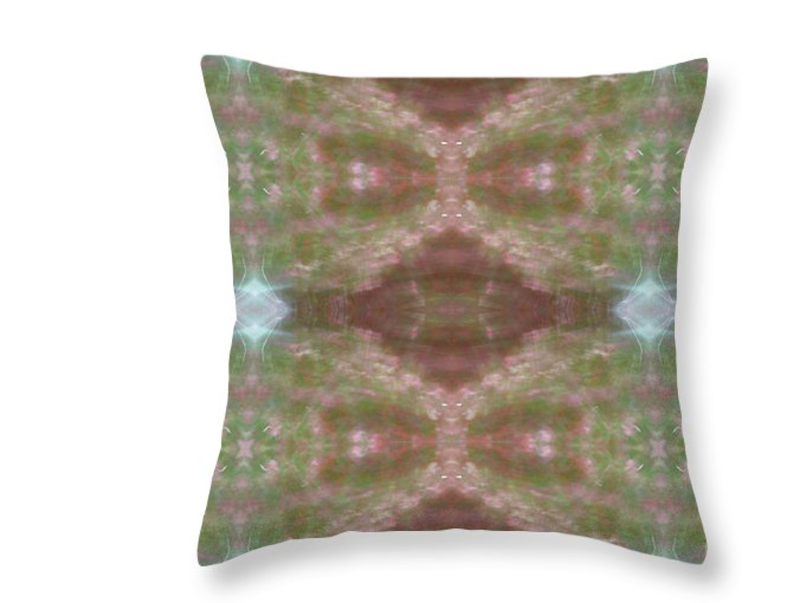 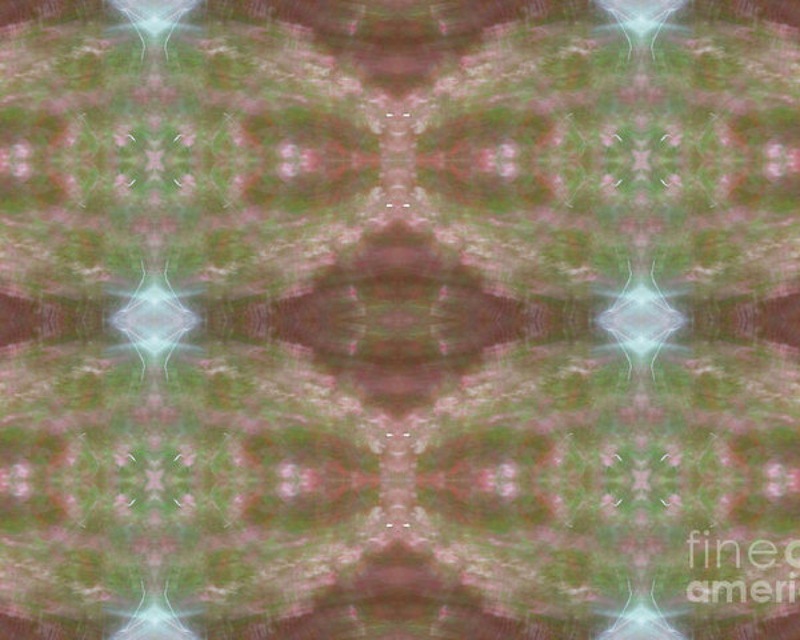 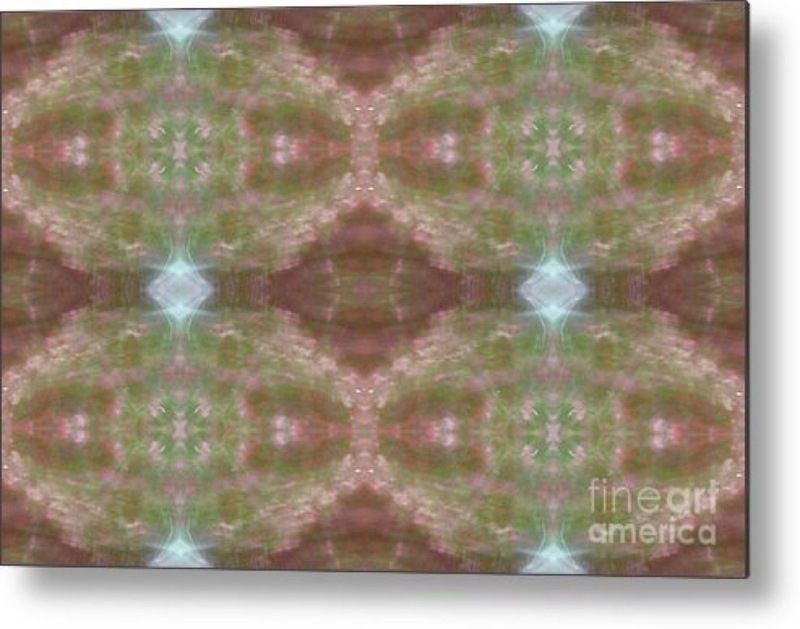 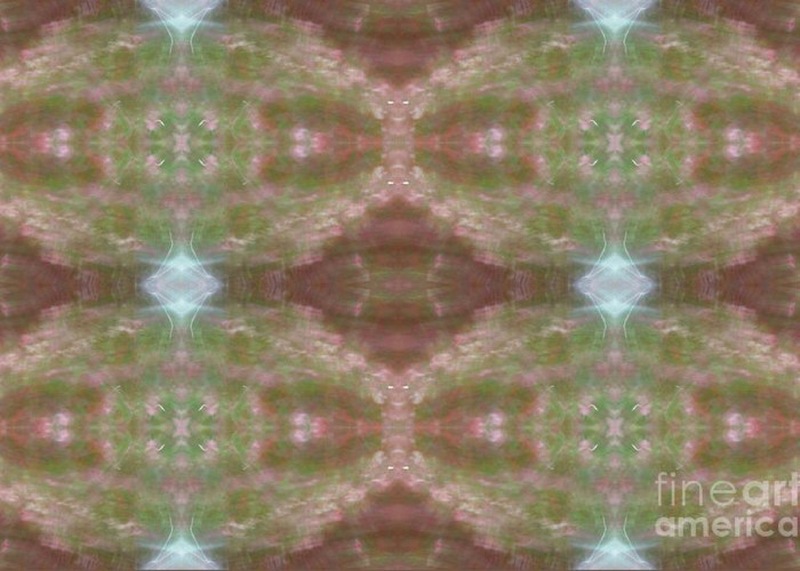 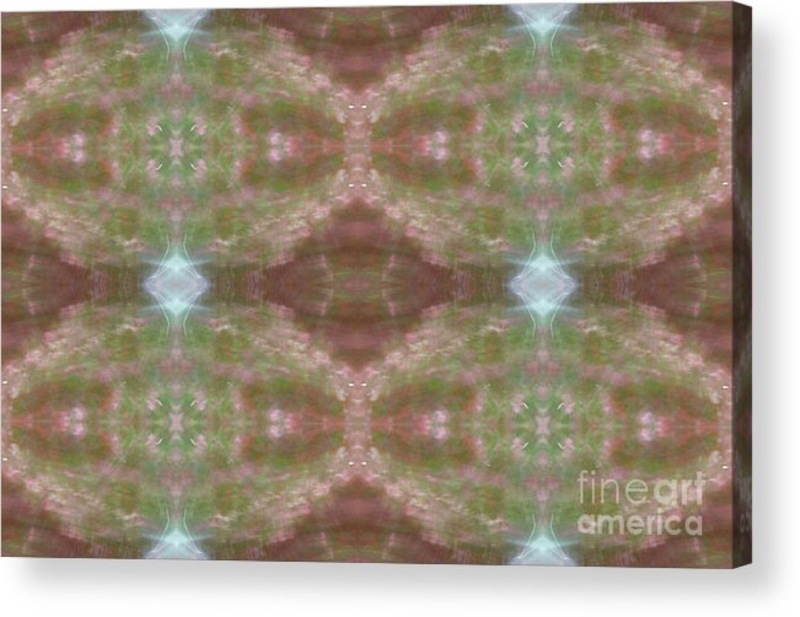 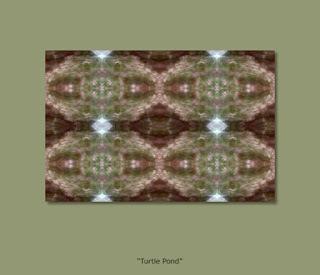 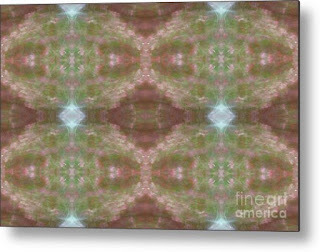 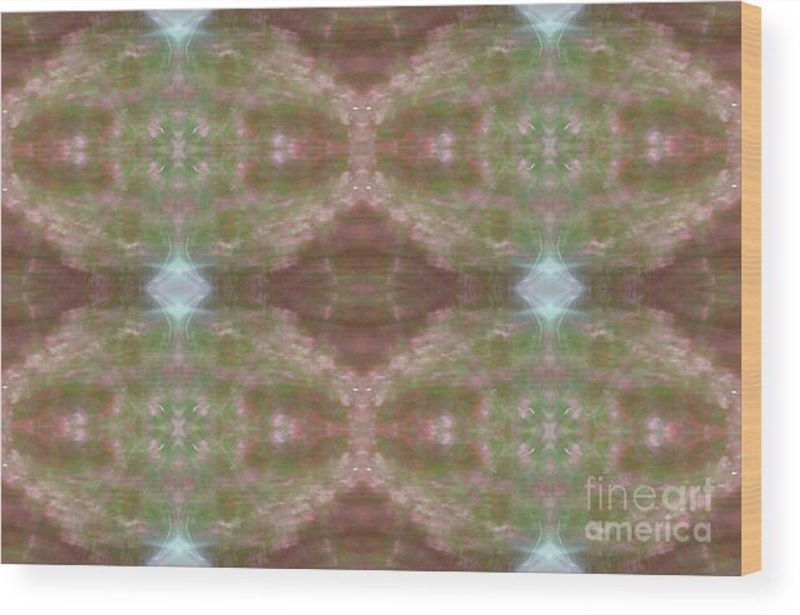 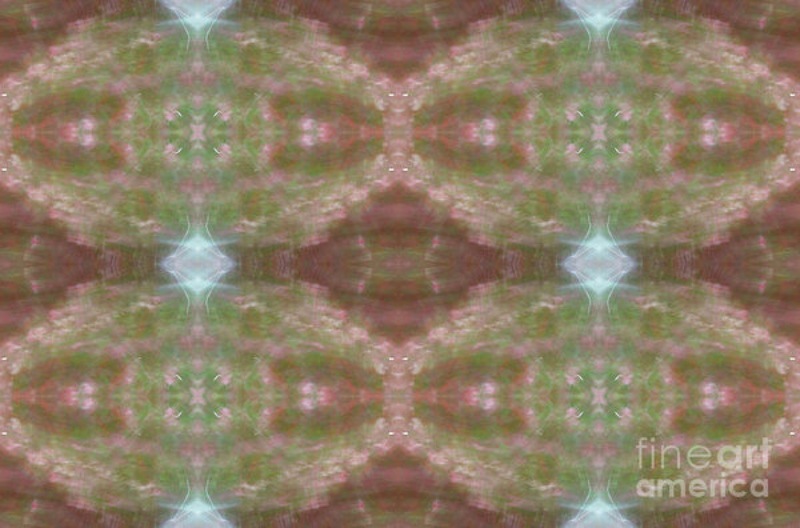 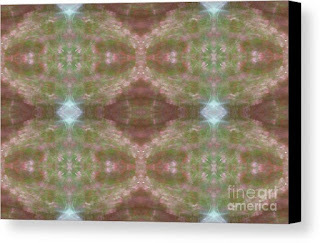 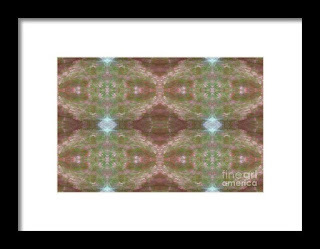 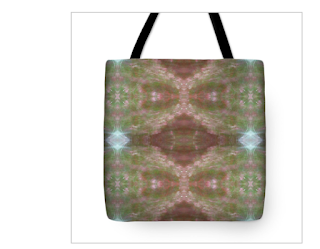 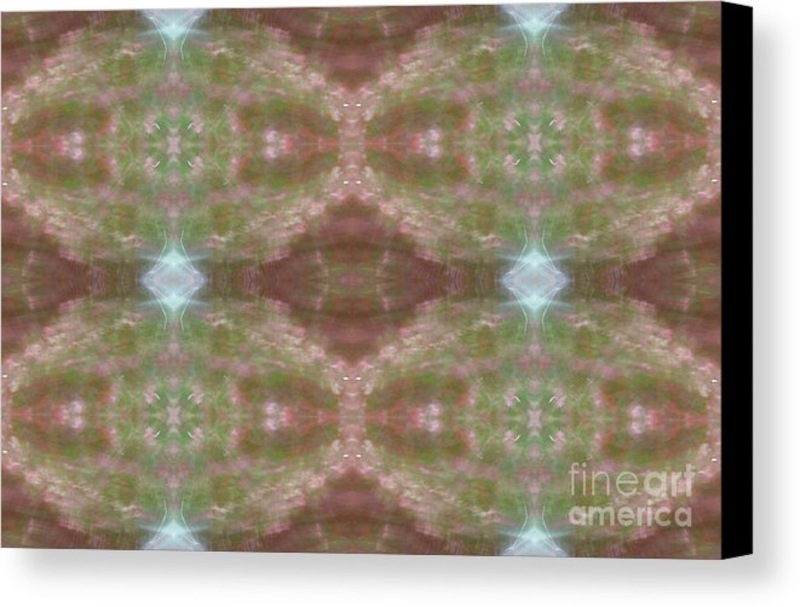 Moreover, these kaleidoscopic photos of Turtle Pond as well as of other points of interest are featured in a collection on Fine Art America (FAA). 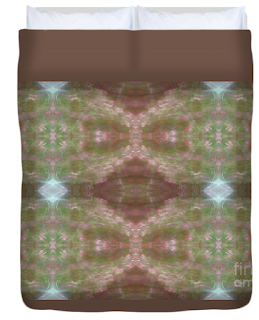 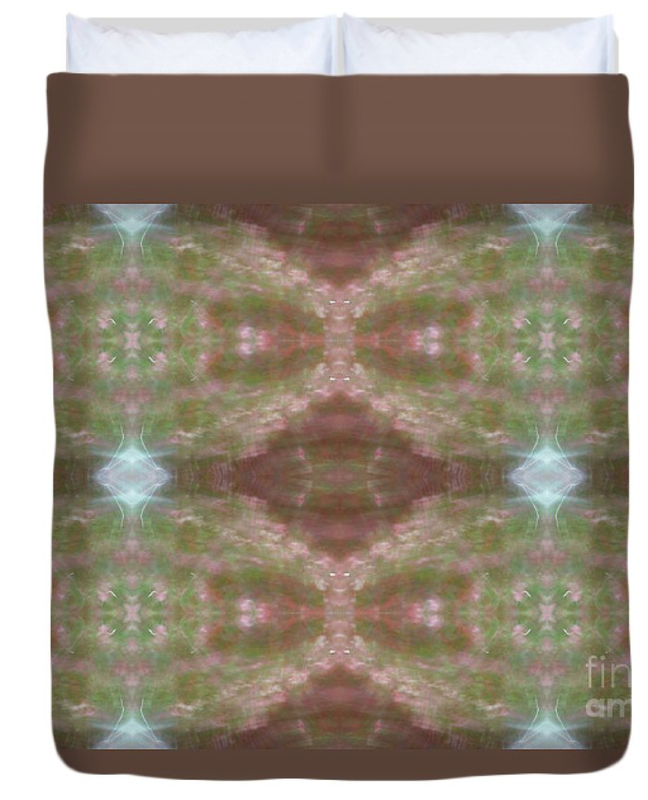 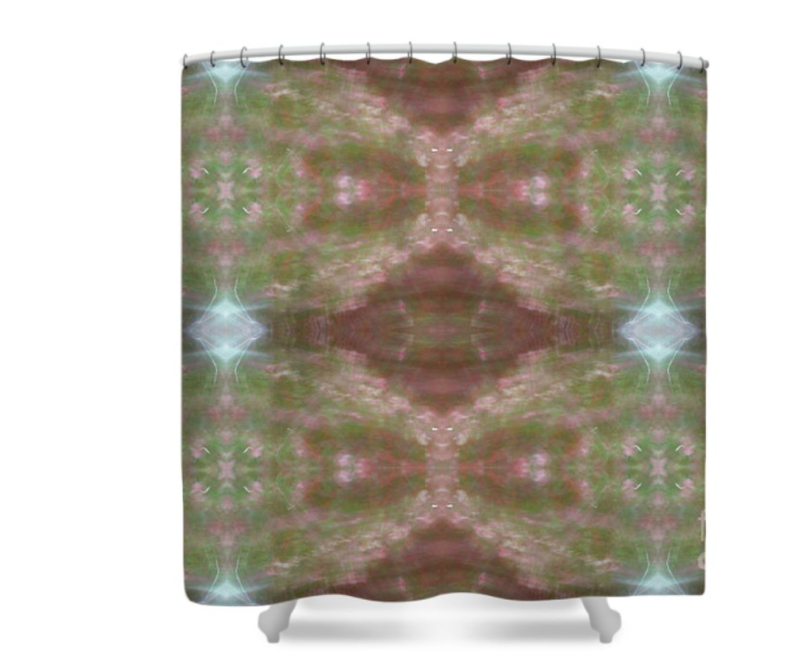 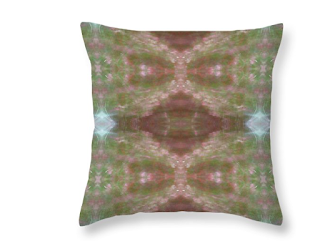 FAA can print them on an array of surfaces for wall art (examples can be found in the following set of screen shots).